There’s a connection between Portland, calligraphy, and Steve Jobs that often goes unnoticed. It dates back to 1972 when Jobs audited a calligraphy class at Reed College. 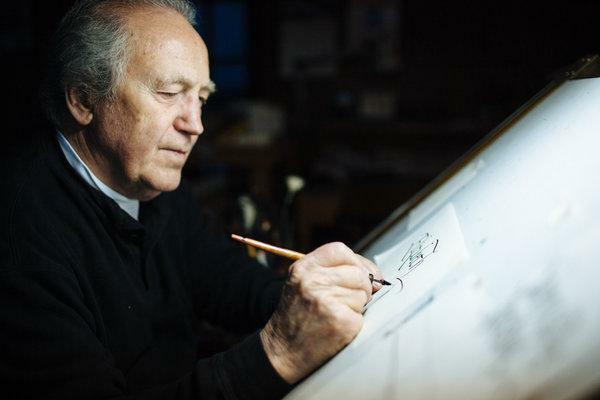 It happened to be taught by Robert Palladino, a world-renowned calligrapher and Roman Catholic priest who introduced university students to the elegance of the handwritten word from 1969 to 1984 (following in the footsteps of legendary calligrapher Lloyd J. Reynolds). The college’s calligraphy program, which flourished from 1938 until Father Palladino’s retirement, was widely regarded as the foremost in the country, training many respected artists, typographers and graphic designers. For decades, nearly every sign and poster on campus was the graceful fruit of its labor. Little did I know that when I signed up for an elective calligraphy class on a whim my senior year of college, it would be taught by none other than Robert Palladino. He was dedicated to the craft of calligraphy—pensive, honest, and absolutely aghast if his immaculate penmanship was ever mistaken for a font. He used to tell the story of writing a check at Home Depot and having an employee say that it was so perfect, it looked computerized. Palladino was mortified. Palladino’s life was devoted to the beauty and artistry of the handwritten word, and he shared this passion with his students. He has quite the legacy to show for it. Though writing by hand is becoming less prevalent or necessary in our increasingly digital world, I owe my own love of calligraphy to this first class—and it’s also why I teach. Whether or not we need to write, it is worthwhile. Though Father Palladino demonstrably influenced Mr. Jobs, the converse cannot be said. To the end of his life, Father Palladino never owned, or even once used, a computer.